Our company is a professional cleaning service provider and we specialise in office cleaning services. We are located here in Tottenham N17, close to you and your office. We have time-tested methods, perfected over the years and we have the latest technology necessary for a professional cleaning. We use cleaning products and solutions that are chemical-free and eco-friendly. Our cleaners are the best experts in their field and are adequate to deal with any challenge. They will come to your office and tackle the chores right away. Our cleaners are detail-oriented and will make sure everything is perfectly cleaned. Our company puts its clients as a number one priority and we strive to always give them the best service possible. Trust us, just like many office managers in Tottenham did and now enjoy the benefits from our cleaning service. Over the years Cleaner Tottenham have perfected not only our cleaning methods but our approach and treatment towards our clients. We have made it our goal to always exceed our clients’ expectations, we deliver what we promise, and more. Our employees are very friendly and punctual. They work fast, but they will not miss a spot. Your office will be sparkling clean and flawless within hours. 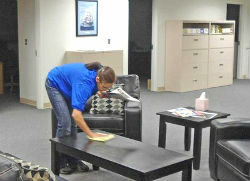 Our cleaners will also take out the trash, reload toilet paper, refill soap dispensers, water your office plants. We promise you nothing more than what we can achieve. Our cleaners will vacuum the carpeting, sweep and mop the floors, remove cobwebs and mould, wash the windows internally, dust all the furniture, remove fingerprints from computers, phones, etc. Hurry up and call us now if you know what is important for your office atmosphere. We guarantee 100% efficiency. Contact us and let us prove you we are the best. Copyright © 2015 - Cleaner Tottenham.